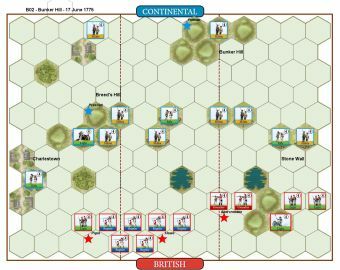 General Lee’s failed attempt against the British rear guard, gave Cornwallis, he believed, the opportunity to defeat Washington’s army and ordered his command to press the attack in the stifling summer heat. 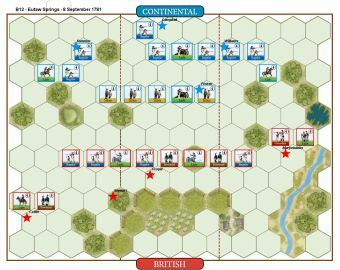 As the Continentals fell back, Washington consolidated his troops in a new line on the heights of Perrine Farm Ridge. 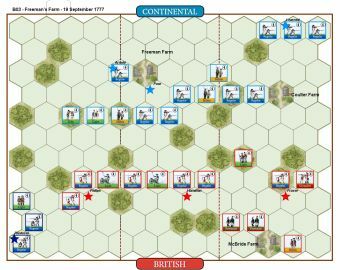 Exhausted by the day’s fighting, and now faced by the artillery in the new Continental position, the British soldiers faltered and the pursuit collapsed. 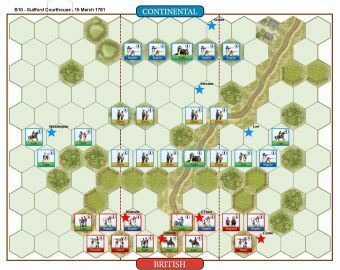 Cornwallis brought forward his artillery to counter the Continental batteries and as the artillery duel went on for hours, the British tried to flank the Continental left, but were forced back. 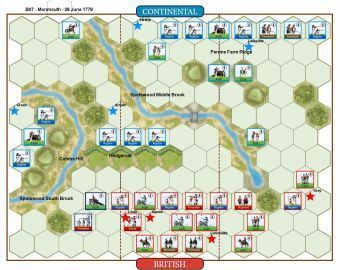 Washington then ordered Green’s artillery to Combs hill, which began to rake the British behind the hedgerow forcing them to retire. 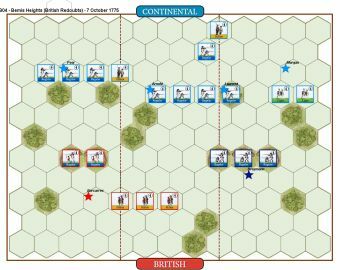 Washington then went on the offensive and after heavy fighting, the British pulled back. 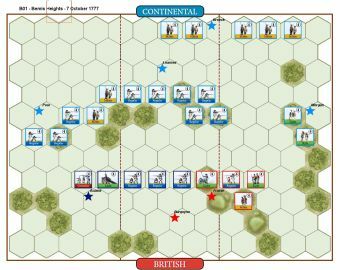 Washington was ready to continue the battle the next day, but Cornwallis resumed the march to New York City during the night. 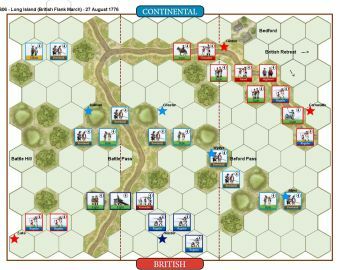 • The British player gains 2 Temporary Victory Banners at the start of his turn for each hill hex of Perrine Farm Ridge occupied by a British unit. 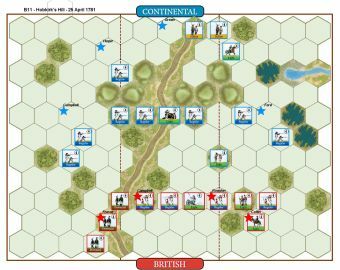 Place two British Victory Banners on the hex at the start of the turn when occupied. 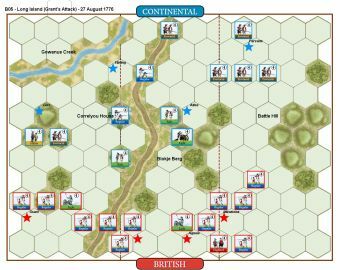 • Molly Pitcher rule is in effect. 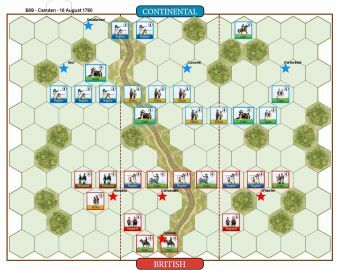 One time during the battle, when a Continental artillery unit on Perrine Farm Ridge with one or more lost blocks is ordered, add one block to the unit. 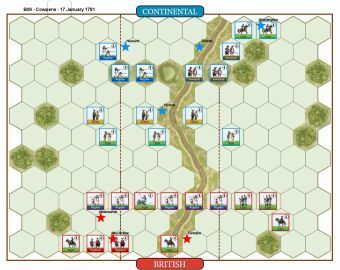 • The hedge terrain hexes are treated as a fence. • All streams are fordable. (RB) THE HEDGE IN MONMOUTH IS TREATED AS A WOOD FENCE.